UL Lafayette students will “Yell Like Hell” Oct. 8 to show their support for Louisiana’s Ragin’ Cajuns as they take on the ULM Indians during Homecoming 2003. The competition, which includes student organizations preparing skits and step shows, will be held at 7 p.m. at Blackham Coliseum. Groups will be judged for creativity, originality, content, spirit and preparation/organization. Anyone needing more information about “Yell Like Hell” should contact the Union Program Council at 482-6939. 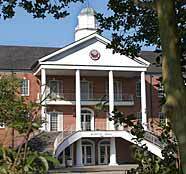 Other Homecoming 2003 activities set for Oct. 8 include a Cajuns Can Care food drive at 8 a.m. Students will be collecting canned goods until noon at Louisiana’s Alumni Center on St. Mary Boulevard. For more information about Homecoming 2003, contact Louisiana’s Alumni Center at 482-0900 or the Union Program Council at 482-6939.